A.A.R.P.’s state director says a new survey by the organization shows most of its 400,000 members aren’t ready to give up on health care reform. Bruce Koeppl says they wanted to do the survey in the wake of the numerous congressional town hall meetings and the "well-documented concerns" and "myths" that came out of those meetings. "As you’ll see these results are a firm rebuttal of the notion that older Iowans don’t want health care reform this year. In fact they show that our members believe just the opposite," Koeppl says. 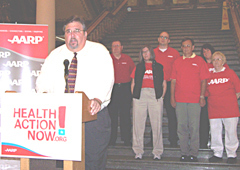 He says the findings also reject the notion that older Iowans are against changes in Medicare, as he says Iowa members of A.A.R.P. "overwhelming support" strengthening Medicare as a part of health care reform. "This senator has put a lot of work into health care reform, he has done his homework, he’s got a great staff, and I think that we’re going to continue to put the pressure on from out point of view that folks want something to happen…He’s clearly a national leader so it will not only be here in Iowa, but across the country. Koeppl says this poll will be part of the effort to try and convince Grassley to move health care ahead. "You know as well as I know that you don’t force Senator Grassley to do anything he doesn’t want to do," Keoppl says, "but we will continue to talk, we will continue to reason and provide evidence and information that we think supports our position." Keoppl says A.A.R.P. has not endorsed any plan yet because they don’t know what the final plans will look like. For more information on the A.A.R.P. survey and health care stance, go on-line to: www.healthactionnow.org .